The innovative new Hitch Mounted Ramp from Harmar allows users to easily load a power wheelchair or scooter into the back of most Van's, SUV's and station wagons equipped with a rear hatch and will work with a class 1, 2 or 3 hitch. 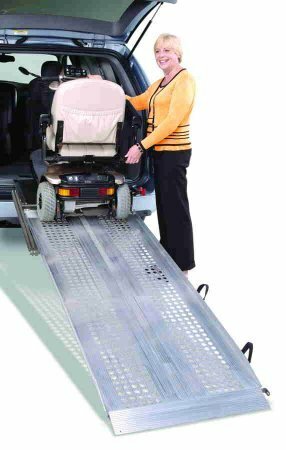 The Hitch Mounted Ramp offers the ultimate portable ramp solution, eliminating the heavy lifting and storage space needed for standard portable ramps. This ramp easily attaches to your existing hitch in minuets with no drilling or wiring required. Requiring only 15 pounds of force to operate and offering a 700 lb. capacity, the hitch-mounted ramp unfolds in just seconds with minimal effort. The unique non-skid metal surface is designed for excellent wet and dry grip and offers improved traction and reduced wear. No need to replace worn or peeling traction tape. 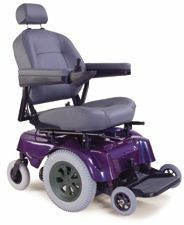 Spring-assisted folding mechanism and side handles allows you to fold and unfold the ramp with ease. Attaches easily to Van's, SUV's or station wagons with a class 1, 2 or 3 hitch. Heavy duty weight capacity of 700 lbs. 30" width with 8' or 10' lengths makes this ramp compatible with most any power wheelchair or scooter. 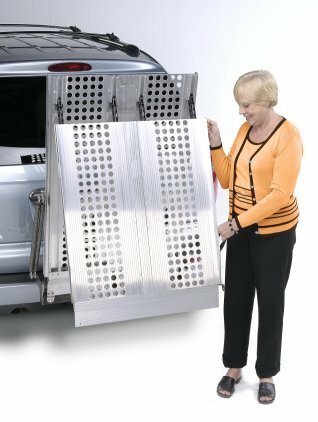 Eliminated the need to store and lift heavy ramps in your vehicle. Only requires 15 pounds of force to operate. Retain driving visibility through holes in ramp. Unique non-skid metal surface for excellent wet/dry grip and traction. Takes only minuets to install on any class 1, 2 or 3 hitch. No expensive installation fee's!! Secure locking pin keeps ramp locked in place when not in use.